Coventry and Warwickshire has an inspiring choice of local attractions. In the Heart of England and featuring some of the finest heritage that the country has to offer it makes the perfect destination for a short break. 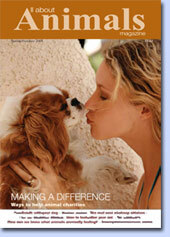 Why not combine city with countryside, here we look at some of the best destinations on offer. The medieval city of Coventry, may not register in many people's minds as a must see destination as it tends to conjure up images of industrialisation and manufacturing. However this is a big misconception as Coventry is a city undergoing huge changes and with a multi million pound regeneration programme it deserves to be top of the list of any visitor to the region. The town is dominated by its two cathedrals, the ruins of the old and the new which is unsurpassed as homage to 1950's architecture. The old cathedral dates back to the 11th century but wasn't given cathedral status until 1918. It was destroyed during the Second World War as the result of Luftwaffe bombs. As soon as the flames had died down and the dust had settled a decision was made to rebuild the cathedral in style of the age and in a spirit of hope and renewal. . Which is demonstrated by some charred timbers in the shape of a cross found amongst the remains of the cathedral in the shape of a cross, the cross was placed on the alter and inscribed "father forgive" and remains there to this day. The ruins of the old cathedral make a stunning backdrop to the city, the impact is really felt when walking from the ruins of the old cathedral into the overpowering grandeur of the new. The feeling on entering can only be described as a rebirth, the new from the old. The focal point of the building is the magnificent tapestry of Christ the King designed by Graham Sutherland behind an alter of concrete to emphasise the contrast, simplicity and ornate. The huge baptistery stained glass window designed by John Piper is another focal point made up of 195 panels in total. All around are a series of intimate chapels giving the visitor a more personal feel and a chance to reflect. The newest addition is the Millennium Chapel that is open for use by all Christian faiths to use and is surrounded by a glass screen bearing names in memory of benefactors to the cathedral. Only a few minutes walk from the cathedrals is Holy Trinity Church, a 12th Century parish church. The church is often overlooked due to its more famous neighbour but it is a building of historical importance in its own right and the interior a magnificent mediaeval doom painting and 14th century stained glass. 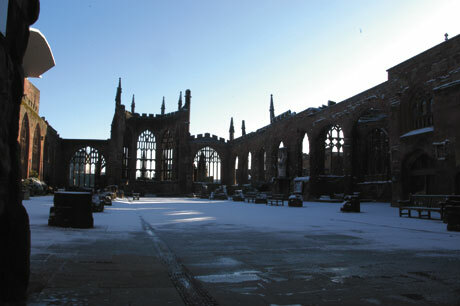 Before the 16th century Coventry had numerous monasteries but most were closed during the reformation. Part of the past can be seen in the newest editions of the visitors map at the Priory Visitors Centre and Undercroft. At the centre interactive displays transport the visitor to Coventry's medieval past learning how people lived hundreds of years ago. Close to the visitor centre is the Undercroft which had been buried for centuries. Guided tours are available of the excavations which centuries ago had been part of the priory complex surrounding the original cathedral. Readers who are familiar with the Time Team BBC series with Tony Robinson will remember the team did a programme from the site a few years ago. Returning to the area at night allows one to view the area which is then bathed in stunning lights The night time visitor may also be pleasantly surprised by the recently opened diverse selection of restaurants offering fine cuisine located close by. Coventry Transport Museum which underwent a multi million pound face lift last year, is world famous for having the world's largest display of British cars, motor cycles and cycles and houses a collection of significant national importance. The museum is home to 230 cars, 250 cycles and 90 motor cycles all made in the UK and many made in Coventry. Some of the cars are unique one-offs that never saw production yet all have a place in this historical setting. This is a diverse collection from Aston Martin, to Jaguar; Peugeot to Triumph, to the Coventry based London Taxi International who incidentally is the only firm still producing motor vehicles in Coventry. Ever popular with parties of school children are the displays showing the history of the motor industry and the role transport played during the second world war all done by interactive displays. All this makes the museum a must visit destination. Coventry and Warwickshire really is the perfect short break destination combining city and countryside. It is possible to do the itinerary described in this article over two days but spending an extra day or two really does the area justice. Ryton Organic Gardens just outside Coventry is the UK's first National Centre for Organic Gardening. At the centre is a fully interactive visitor centre, vegetable kingdom, a fine licensed restaurant serving delicious organic food and 10 acres of gardens, many with individual themes such as the herb garden, children's garden and compost garden. Our visit took place in December so a definite return visit was mentally booked to see the best of the gardens in Spring/Summer. Kenilworth Castle often gets overlooked in favour of Warwick Castle, however this means that one of the countries most important ruined castles is missed. Dating back to the 12th century on arrival the sheer majestic scale of the castle overawes the visitor and dominates the landscape. Steeped in history it was home to Simon de Montford and Edward 11 was imprisoned there. In the 16th century Robert Dudley, favoured courtier of Elizabeth 1, was given the castle and the whole top floor was renovated making it a building fit for a queen. Unfortunately this was the end of an era, the castle was mostly destroyed and the lake drained away after the English Civil War. 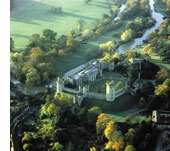 In 1939 the castle was saved for the Nation by John Davenport Siddeley(Later Lord Kenilwoth). An antiques business was run by the family for many years in the gate house and today it is open to the public complete with original furnishings. In the 1970's the castle was given to English Heritage and its brooding presence reminds all who view of past glories. No visit to Coventry and Warwickshire is complete without a visit to Stratford Upon Avon the birthplace of William Shakespeare. The Shakespeare Birthplace trust own and maintain five period homes all either lived in our connected to William Shakespeare. Each house has been restored and is faithful to the period, many contain rare artefacts and each one has a beautiful English cottage garden. The first house on the visitor's itinerary is Shakespeare's birthplace that is situated in the town centre. It is like stepping back to the 1600's, as the house is faithful to the period including the fabric-adorned walls so beloved by the Tudors. From Shakespeare's birthplace it's only a few minutes to Nash's House also in the town centre. Shakespeare's granddaughter's first husband Sir Thomas Nash owned the House; a man of considerable wealth and the house reflects this with original pieces of period furniture. Unfortunately none of Shakespeare's original estate (new place) remains but the foundations have been preserved and turned into an Elizabethan knot garden. Hall's Croft the home of Shakespeare's oldest daughter Susanna and her husband Dr John Hall prior to inheriting New Place. The house reflects their status in furnishing and art. Upstairs there is an exhibition of Dr Halls life showcasing the work of a rural doctor of that period. Outside the town is Anne Hathaway's cottage the family home of Shakespeare's wife. The couple married when William was eighteen and Anne was twenty-six. This stunning thatched cottage was occupied by descendents of the Hathaway's until it was purchased by the trust in 1892. It contains many original family pieces including what may be the original bed mentioned in Shakespeare's will. Finally there is Mary Arden's House the childhood home of Shakespeare's mother. Experience rural life in the past, outbuildings contain many exhibits and rare English animal breeds, including Gloucester Old Spot pigs, are kept making the farm a delight for adults and children alike. Coventry and Warwickshire makes the perfect short break destination. 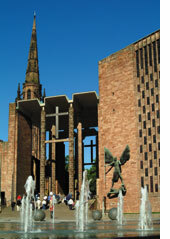 Coventry is a city enjoying a huge rival combined with celebrating the cities unique culture and heritage. If all this isn't enough the stunning countryside of Warwickshire is just a short drive away so whether history, gardens or attractions appeal there truly is something for everyone!